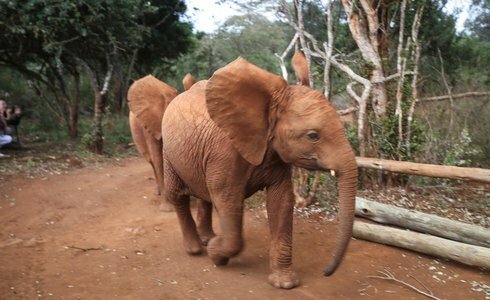 A excursion where you spend a wonderful half day at the with baby elephants! Visiting the the Daphne Sheldrick Elephant Orphanage. A haven for elephant orphans rhinos and other animals. A chance for you to see the elephants at close reach watch them being fed and taking bath in the river. You will be collected either in the morning or afternoon and drive you to Daphne Sheldrick Elephant Orphanage . It's the world's first elephant orphanage established to feed, nurse and house young elephants or rhinos lost or abandoned. Sheldrick Baby Elephant Orphanage in Nairobi National Park drive takes approximately 45 minutes Visitors at the orphanage could see the baby elephants being fed milk from gigantic feeding bottles, definitely an unforgettable sight! At 11h00, the baby animals are brought from the National Park for a mud-bath at the orphanage, where for an hour you can get close to them and sometimes even touch them. In addition, there is a keeper who will give a talk about the elephants, where they came from, how they are getting on, and how some of the previous orphans are progressing.